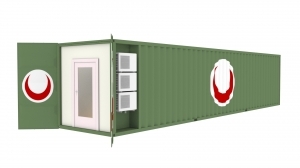 Mobile Container types of mobile hospitals has been specifically designed for the purpose of obtaining benefits in the field of military space. Military facilities, municipalities, rural areas, small towns, and in areas without institutions buildings due to civil disaster or a similar field clinic field is equipped to meet the needs of the people in. Models are with standard features, but depending on the needs of medical equipment more options can be offered. Depending on the user’s demand we can develop alternatives, we can also increase the required equipment and optional equipment. Portable emergency or intensive care unit can also also improved. This product has a solid structure and therefore will not be damaged in the shipping stage, the staff is ready to be shipped within the area you want to use immediately.